The patent, which was published on April 9 and spotted by LetsGoDigital, details a device with two transparent screens and a fold in the middle, so it opens and closes like a book and moves from tablet-sized when open to phone-sized when closed. 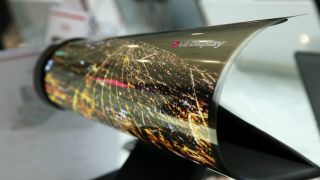 However, each screen is double-sided and because it’s transparent you can even interact with the display from the rear. The two screens can be used as one large one, displaying the same content, or independently, so you could have different apps running on each. And the level of transparency can vary depending on how you hold the phone. If you sit it flat then it’s only slightly see-through, but held up higher it becomes more so. It’s an innovative idea and one which goes into quite a lot of detail, with the patent even going so far as to talk about the camera, which would involve both a single-lens on the front and a multi-lens one on the back, complete with a laser sensor that could see objects in 3D, presumably to help with depth sensing. Don’t get too excited though, as we suspect a device like this is a long way from being launched. Patents don’t always turn into products and we were seeing foldable phone patents for many years before any such handsets launched. This could be the big next step for phones though, and it’s not just LG toying with such a device. Sony for example has also patented a transparent, foldable phone.